The Lenovo CCO wins Outstanding Professional (In-House) Award. Video From Diverse Voices Book Launch, December 2018. 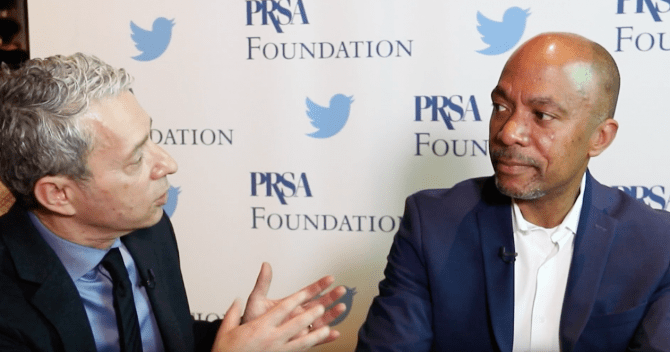 During our pro-bono work at the Diverse Voices Book Launch, we were able to interview Torod Neptune, CCO and VP of Worldwide Communication at Lenovo. After meeting him, it’s no surprise he won the Outstanding In-House Professional honor at the PR Week Awards on March 21. During the interview, Torod explored the best ways to turn talk of increasing diversity into action and results. He is one of 40 extraordinary communicators featured in the book Diverse Voices, which comes from the PRSA Foundation and is designed to help communication leaders and professionals better understand the challenges faced by emerging majorities in the field. To purchase Diverse Voices, visit www.diverseleadership.net. DOUG: I’m Doug Simon, D S Simon Media, and I’m here at the New York launch of the book Diverse Voices. With me is one of the brilliant communicators who’s featured in the book, Torod Neptune is CCO at Lenovo. Thanks so much for being with us. TOROD: It’s good to be here. DOUG: Can you maybe share some of the stories that you shared within your section of the book? TOROD: Sure. I talk a little bit about what originally interested me in the comms/marketing/PR industry. And I’d say it’s been from an early age, a curiosity that was sparked in me by a mother who was a librarian. So, we grew up with books being really almost our entire world. And so I think of the many benefits that books bring to young children as exposing them to a broader world, you know possibilities, stories, the power of stories to communicate purpose and values and meaning and relevance and all the things that I think as communicators, as marketers, as brand markets we do in a daily career life of a person who is practicing this craft, and so I thank my mother for that early grounding in what was a very fundamental competency that serves me quite well even to this day. DOUG: Great. And you were on a panel of chief communication officers today, and one of the things you said caught on quickly as a catch phrase: the idea that it’s no longer a minority of diverse, it’s the emerging majority that we’re talking about, and so that makes it a business imperative that we have to get engaged people of all types and all perspectives, all experience. TOROD: Yes, I agree wholeheartedly. I mean as a business leader, most fundamentally to me is the focus on how we drive growth, grow market share, drive revenue. And you can’t do those things without an appreciation of who your audience is and what we know today more than has ever been the case in the history of our country is that our audiences, our markets that we’re trying to influence, are increasingly majority diverse. And so that behooves us as marketers to ensure that we can reflect the reality of what that market looks like, both in the way we think and the way our teams are organized, and in the ideas that we’re presenting to help solve some of these very significant business challenges that we’re trying to address as marketing people. DOUG: And that almost makes it seem that quote “multicultural marketing” as a slice is really just changed with “marketing” as the whole pie itself. So what are things as business leaders that you have? How do you help make your team more diverse, not just to track but really retain— and not just retain but help these people grow and become leaders themselves? TOROD: I mean I think it boils down fundamentally to the culture that a leader helps establish, both in terms of a culture that sees the imperative that diversity ism again not just the niceties but the business imperative, as it relates to our focus on understanding who our customers are, and ensuring that our teams reflect that. And then I think establishing that accountability both in terms of the day to day accountability as a leader that we establish for our teams, and then the mechanisms the actual individual KPIs that we set so that our teams have goals, real meaningful goals that are able to monitor and track and measure our progress against delivering. That at the end of the day is where we’ll move from a nice talking point or a nice to do to something that really is a business outcome that we are measuring and driving just like we do sales growth or brand growth or customer growth or customer retention. Diversity is one of those KPIs as well that we have to hold out as a deliverable for the entire team. TOROD: Yes. So we started a little over a year ago in a major agency RFP process really mandating that for agencies to compete and be considered as partners for our business they had to prove to us that they had the similar commitment to diversity and inclusion within their teams. It’s not just that their teams need to look diverse, they had to have a track record of incentivizing their organization and enabling their teams to grow and look like the customers that we were trying to recruit and retain within our business. DOUG: And I think it’s important that people who really want to be successful in this world we live in now pick up the book diverse voices and read it just valuable lessons from just impressive person after impressive person after impressive process. Congratulations, your worthy for being included in such an elite group. TOROD: Thank you. I appreciate that. I’m happy to be a part of it. DOUG: Cool thanks so much. D S Simon Media is proud to donate its services in support of the Diverse Voices Initiative.